If you’ve paid any attention to the news – or rather the fawning, biased non-news spewed forth from Obama’s MSM media shills – you know that on December 10, 2009, President Obama took a short break from his duties as POTUS in order to fly to Oslo, Norway to accept his Nobel Peace Prize. Even more than usual President Obama’s acceptance speech was a “wonder” to behold. 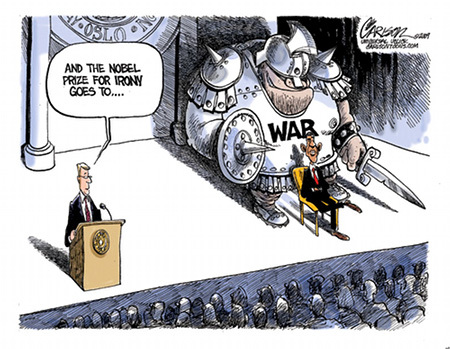 Don’t get me wrong; I personally found very little that was glaringly inaccurate or offensive to America and Americans in President Obama’s Nobel Peace Prize acceptance speech. But it takes levels of narcissism, arrogance, and raw chutzpah that beggars the civilized man’s mind to use one’s Nobel Peace Prize acceptance speech to justify two ongoing wars and to lecture the audience on the meaning of “just war” and that we won’t achieve peace in our lifetimes. Two personal points – One, Obama’s linking of himself with Dr. Martin Luther King, Jr. was naught but shameful, racialist pandering more suited to an ACORN operative than the POTUS. Bringing up Gandhi was especially sweet! It was a beautiful dig at the Nobel Committee for fives times refusing to award Gandhi the Peace Prize because it would have Norway’s political relationship with England. This entry was posted on Monday, December 14th, 2009 at 7:46 am and is filed under Humor, Politics. You can leave a response, or trackback from your own site. I agree with you that the MSM is not even news anymore. But, it’s been that way for quite some time now, including during the Bush Administration. So, while I think the MSM has become more of a tabloid talk show than anything close to real journalism (more often than not, at least), it seems disingenuous to say that they’re all in the bag for Obama. They’re not questioning either side of the political spectrum. They don’t ask the hard questions to anyone, regardless of party affiliation. Their glaring error isn’t in the biased support of one over another so much as in not holding all people in the political realm to some level of accountability, which essentially is their job in the first place. In the same way that they might be part of the glamorization of Obama, they’re also not demanding answers from Palin and Cheney for the hard questions that they should be posing. Ummmm, Palin and Cheney are not in office. So, since they aren’t in office, they shouldn’t be held accountable for their actions? That makes no sense, Vishnu. You must be one of the many who are ignorant of the role that the media is supposed to play in regards to politics. Regardless, I’m well aware that they are no longer in office. But, we are still dealing with what Cheney did while in office for eight years, and he should still be held accountable – if nowhere else, then by the MSM – for those decisions. His culpability doesn’t just end when he leaves office. As for Palin, she was Governor of Alaska until just recently and was the VP candidate for the GOP. She’s one of the biggest voices on the political right and, whether or not she’s currently in office, should be checked and balanced by the MSM when she is out there touring a book full of non-facts and building up support for a 2012 run. There’s a problem with your theory. The media is so very much biased against both Cheney and Palin that they won’t engage either one of them, though for different reasons. They stopped questioning Cheney because he had answers to their questions and could, and did, deliver those answers in a manner that prevented the MSM from spinning him as the “demon” you and your so believe him to be. They never bothered questioning Palin because that might have lent her credibility. They preferred to marginalize her – and by proxy the Right – by not engaging her on substantive issues, but rather only on crap. BTW: It’s not the MSM’s place to “check and balance” politicians. It’s there role to report the news of the day in as close to an objective fashion as possible. It’s not a theory. It’s reality. You say that media is to report the news in an objective fashion, and that’s precisely why it’s a check and balance on the government. When the media becomes merely a podium for people to spout off their opinions and beliefs without any regard to facts or reality – and I’m talking about people on all sides of the spectrum – you lose that objectivity and become useless. Also, you’re imposing a reasoning for why the MSM has not done certain things, but you have no evidence of this other than your own biased reasoning. It’s a circular argument and holds no water. You believe the MSM is in the bag for Obama, so you just support this by reiterating your beliefs. You say the MSM stopped questioning Cheney because he had answers that would go against the supposed MSM agenda? Opinion is not fact and opinion is not evidence. It’s basically a conspiracy theory. Either way, that’s not what I was even trying to get into at all. I’m merely saying that the MSM is not doing its job, with regard to anyone. A journalist’s job is to be objective, report the facts, cut through the crap and tell the real story. It is exactly the job of the media to be a check and balance to the government. It’s the way that the American citizenry keeps the politicians in check by forcing their actions, their words, their policies out into the public forum for all to see and discuss. Journalists aren’t supposed to be swayed either way – if someone is lying, the journalist should ask the right questions to expose the lie through facts, cited sources, and on-the-record interviews to give the whole story, not to damn or to judge, but to expose the truth. Thank God Vanity Fair was there to exploit Levi along with all the other MSM outlets. And you speak of accountability? Vishnu, perhaps you didn’t read my post. I agree that the MSM is not doing its job. Most of the outlets have become nothing more than tabloids. Or, at best, simply a forum for people to spout off as “experts” without so much as a basic fact check. Pop culture, of course, is a different realm entirely. Well, it should be, but that’s the problem that we’re all talking about here, isn’t it? That the MSM has just become pop culture? It’s lost any journalistic credibility. We differ on why or for what reasons this has happened. Regardless, it’s failing the American public. Even in disagreement, Mason, I must say that your last comment was very, very well-said. For whatever reason – or combined and conflicting host of reasons – the MSM is a failure and a mockery of what it once was. My point was that I see Palin and Cheney frequently attacked in the media. Indeed, the media has a bazaar interest in tearing them down. It’s difficult for me to see no distinction in MSM’s treatment of Palin and Cheney versus Obama and other actual, elected, and serving officals. In my opinion, MSM is in the bag for Obama and its treatment of Palin and Cheney as though they occupy the same place is evidence of it. So, I agree with your comments but not your observations of bias.